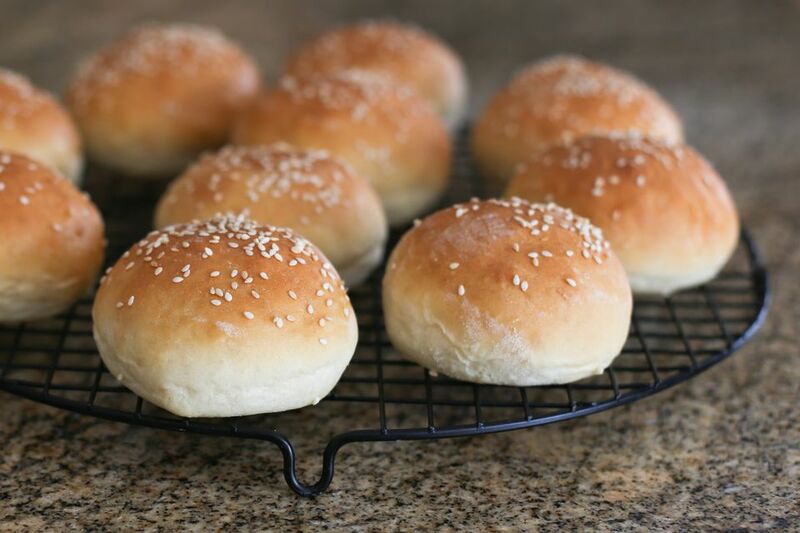 These bread machine hamburger buns are a great choice if you're looking for a quick homemade hamburger bun (that also work for hot dogs). The bread machine makes mixing and kneading a breeze. The recipe makes about 8 large hamburger buns, or make smaller buns for sliders. Brush the buns with a simple egg wash just before they go into the oven and sprinkle with sesame seeds or poppy seeds. The egg white and water egg wash makes the crust a bit firmer and adds shine. For a soft crust, shine, and a bit of extra golden color make the egg wash with egg yolk with 1 tablespoon of milk or cream or a whole egg with 1 tablespoon of water. Add all of the ingredients except for the egg white and water mixture to your bread machine in the order given and set on "dough" cycle. When the dough cycle finishes, turn the dough out onto a floured board and punch it down. Knead 4 or 5 times; add a little more flour as you knead if necessary to keep it from sticking to your hands or the surface. Cover the dough with a clean dishcloth and let rest for about 30 minutes in a draft-free place. Lightly grease a large baking sheet; sprinkle with cornmeal. Alternatively, line the baking sheet with parchment paper and sprinkle with cornmeal. Press the dough into a circle and cut into 8 even wedges; form each wedge into a ball then flatten into a smooth and fairly even circle. Alternatively, shape each wedge into long, narrow shapes for a hot dog or sausage buns, or cut each wedge in half and shape into smaller buns for sliders or party sandwiches. Arrange the dough pieces on the baking sheet and let rest for about 20 minutes. Brush the buns lightly with the egg wash (egg and water mixture). If desired, sprinkle with sesame seeds poppy seeds. Bake the buns for about 18 minutes, or until the buns are nicely browned.